The Guide for Separated Parents - Nick Woodall - family separation practitioner, writer and parental alienation specialist. 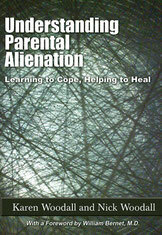 The Guide for Separated Parents (Piatkus 2009), written by Karen and Nick Woodall of the Centre for Separated Families, is a practical book that helps parents to manage the changes that come as a result of family separation so that the impact on children is reduced and they are able to achieve their full potential. In this practical and reassuring guide, Karen and Nick Woodall draw on years of experience of helping separated parents resolve conflict over children that can arise during and after separation. They provide strategies and tools to help you communicate with your ex partner about every aspect of your children's lives.